As PA was hit by the first winter storm of 2016, you may have realized that you were not prepared for such harsh weather conditions. Throughout the storm, several people lost power, some lost their heat, some had frozen pipes, and others were left injured due to slips and falls on the snow and ice. Since nobody knows what a storm will bring, it is best to be prepared for anything! Here are some advanced preparation tips that will help to prevent property damage and injury. In order to protect your home or business, several steps can be taken, both inside and outside, to prevent damage caused by wind, ice, and snow. Here are tips taken from a preventative guide provided by Cincinnati Insurance. Many winterization items can be done before the cold season hits! Items like repairing roofs, cleaning out gutters, clearing drainage systems, and trimming hazardous tree limbs can be done at the end of fall. This allows you to climb ladders, explore the roof, and hike around your property without freezing winds, deep snow drifts, and icy hazards. Unfortunately, items like water backup and frozen pipes are difficult to prepare in advance and should be done before a storm. Before the storm begins, clear and drain outdoor water pipes to prevent cracks and leaks once the pipes thaw. Water backup can happen anytime, not just during a storm, so it is always good to keep a secondary drainage system in place (like a small basement pump with a waterline sensor). The most important element during a cold winter storm is HEAT! Without heat you will quickly experience a myriad of serious problems that are otherwise preventable. Like the exterior precautions, many of the interior items can be done long before the storm is on your radar. One should always have their heating system checked at the onset of the cold season. Things like flues, filters, venting, and fuel levels should be inspected, cleaned, and replaced to ensure that your system works when it is most needed and heavily stressed! Although space heaters are not a proper source of primary heat, they serve as a great backup when the furnace fails or just cannot keep up with the cold. Keeping a space heater on hand, and using it as directed, can be useful in keeping you and your home warm and cozy through a winter blizzard. Although concrete and pavement can be salted and treated before the snow, be prepared for continuous treatment as snow often thaws and refreezes over these surfaces. Be sure to fuel up that snow blower, check your shovel inventory, or review your contract with the local snow removal experts to be sure that you will have the tools for efficient snow removal. Be sure exterior surfaces are well lit and, if you are located in a high traffic area, use signs to advise pedestrians of the possible slip hazard. Although there is no perfect recipe to guarantee a safe and warm storm experience, following these guidelines will help to create a safe environment for you, your family, and your employees. Preventative measures are typically inexpensive and can save money spent on pipe repairs, roof restoration, and furnace replacement. 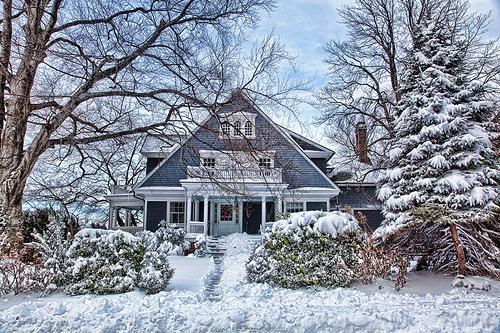 “Prepare Your Property for Winter.” Prepare Your Property for Winter | Loss Control Tips. The Cincinnati Insurance Companies. Web. 29 Jan. 2016. <http://www.cinfin.com/business-insurance/loss-control/tips/prepare-your-property-for-winter>.